Serving 300-400 folks each week at our Welcome Table — at the usual three or four seatings in the dining room and with real plates, glasses, mugs, and soup bowls — takes some hard work! 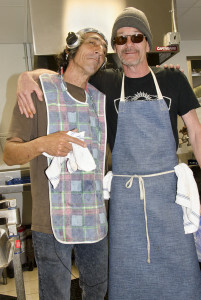 Levity in the dish room helps keep things moving at the necessary fast pace, and a real camaraderie has developed among the companions who work in there. Here Norbert and Phillip, members of this elite team, sport the trappings of their profession (i.e., aprons and dish towels — ear phones optional). However, this is not a closed society, so any and all comers are welcome to pitch in and lend a hand! Logan, Sue, and Marvin especially welcome help during the heavy-lifting later shift (after 1:00 p.m.), when most of the pot scrubbing, all of the mat washing, and the overall floor mopping occurs.